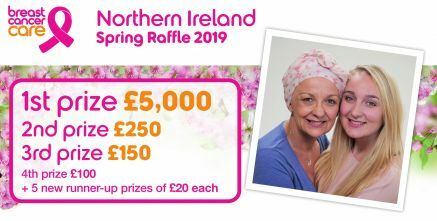 All Breast Cancer Care Northern Ireland lotteries are conducted in compliance with the Betting, Gaming and Lotteries (NI) Order 1985, as amended by the Betting and Lotteries (NI) Order 1994 and as supplemented by the Lotteries Regulations (NI) 1994. Breast Cancer Care Northern Ireland is registered with Belfast City Council. Our registration number is 238.
the date of the lottery. Tickets must not be sold to any persons under 18 years of age. Any persons found to be underage will automatically forfeit the right to any prize. Any monies received from an underage player will be treated as a donation. Tickets must not be sold in the street. Tickets must have a maximum value of £1 each. Tickets will not be sold door – to – door by people who visit people’s homes as part of their employment. Tickets will not be sold as part of a group sale for a set of lotteries where the winner wins a prize in each lottery. Tickets will not be sold by means of a machine. To participate in our lotteries, tickets must be purchased and the ticket must be paid for in full before the purchaser can participate in the draw. Ticket money cannot be returned and prices are as stated on the ticket. No amendments can be made to ticket prices. The price of each ticket sold be the same and the sale of tickets must not be incentivised, for example, 5 for the price of 4. If we promote two or more lotteries in the same date, all tickets will bear a serial number in order to identify which lottery the tickets relate to. All winners will be drawn at random. All proceeds, after lawful deductions, be applied for the purposes of the society. All draws are conducted in a fair and open manner. The draw is operated using a random number generator or blind draw. Draw results are published on our website and in letters to players. Rules are also available on our website. Rules and results are always available on request. We will always aim to resolve any complaints at the first contact. Should our supporter services team be unable to resolve your complaint, it will be escalated to a higher manager. Where all other avenues have been unsuccessful a third party arbitration service will be engaged to resolve a complaint. We aim to protect children and vulnerable people, and exclude them from our lotteries. Both internal and external databases are subject to specific criteria before they are used for our lottery mailings. We age verify all entrants of our on-line lotteries. All players must be over 18 years of age. Players will not be able to continue with their payment until they have self-certified that they are over 18 years of age. Where needed we will access a third party age verification software to determine that a player is of the legal age to play. Failure to pass these age verification procedures will result in a players’ payment being taken as a donation. Protection of Customer Funds - All funds from your online ticket purchase are credited to a client account held with Natwest on behalf of raffleplayer.com, which is entirely separate from raffleplayer.com’s trading accounts. This is a key requirement of the Gambling Commission's licence compliance and is there to protect both you and the charity. When a raffle takes place, proceeds are paid directly from this account to the charity.